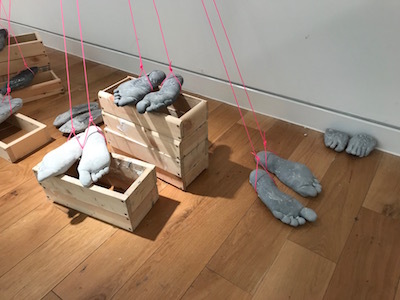 In 2017 Katie Hayward’s took concrete casts of over 70 pairs of student and teachers’ feet while she was artist in residence at Tonbridge School. 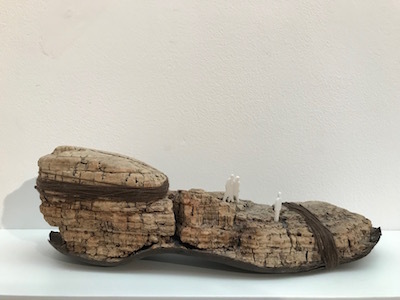 Hayward’s ‘A Sense of Place’ installation was exhibited in The Tunnel Gallery in Tonbridge School in December 2017. Reimagined for ‘Embracing The Underdog’ in Chinatown, London in February 2018 with The London Group and Friends. 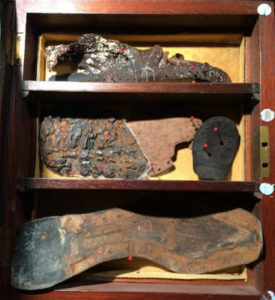 Alison Swan is an artist fascinated by objects with a patina of age and wear, the scarred surfaces and disintegrating forms of which give rise to imagined histories. This is reflected in her ceramic practice through an exploration of surface texture, muted tone and mark-making. Her work is entirely hand-built and fashioned from thinly-rolled, high-fired porcelain and stoneware paperclays, sometimes decorated with oxides, slips or glazes. 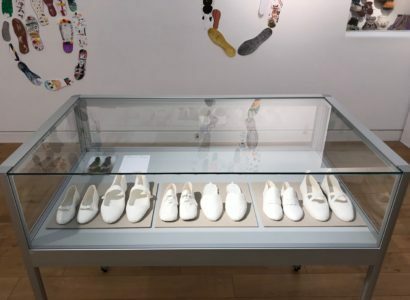 Her porcelain pieces in this exhibition are ghostly reminders of our journey through childhood and adolescence. 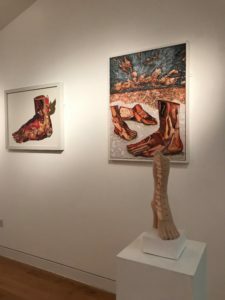 The connotations of ‘feet of clay’ – our all too human frailty and fallibility. FOOTFALL an inclusive celebratory Art project for everyone that will run from now until Christmas. 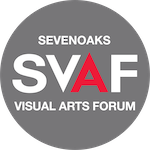 The remit for SVAF running the Sevenoaks Kaleidoscope Gallery as an artist led space has a focus on increasing numbers of the public and arts community visiting the Gallery space. Increasing its profile and visibility. 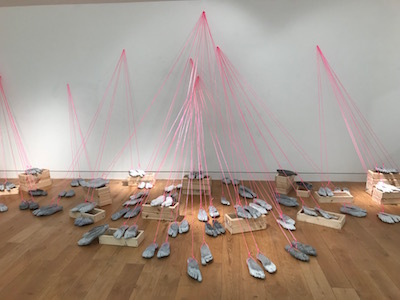 As we approach the end of our first year, we aim to do this with a project about shoes and feet throughout the Kaleidoscope building, Gallery and the surrounding streets of Sevenoaks. 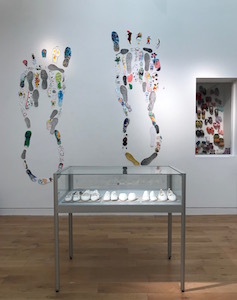 We would like to invite residents; schools, organisations, businesses and members of the community to be part of FOOTFALL by making a fabulous creative shoe or footprint. 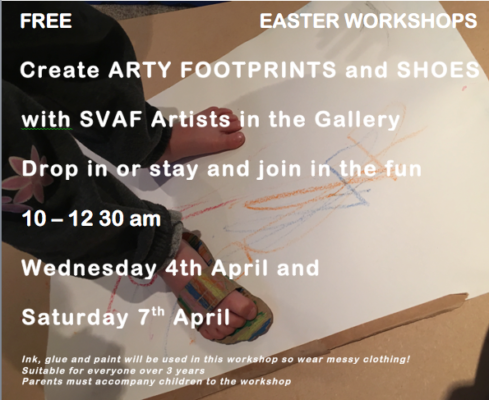 FOOTFALL 1 19th March – closing Saturday 7th April. 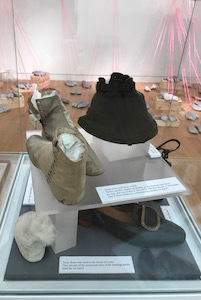 Whatever your age if you are a resident or friend of Sevenoaks you can be part of FOOTFALL by making a shoe. The shoe could reflect who you are, your interests or what you do. 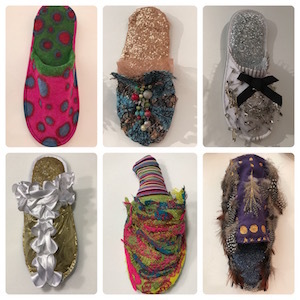 Your shoe can be made of anything in any size: paper, textile, paint, plaster, metal, plastic, print, wood, wool, glitter. We have hundreds of new soft shoes to use as a starting point. What will you do with yours? 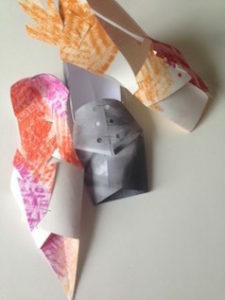 Look at making ideas in the Gallery or you can do your own thing. 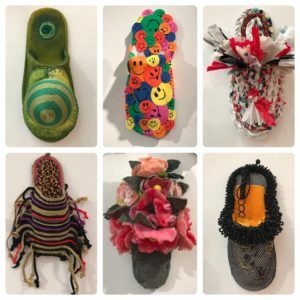 Call in to the Gallery and take a shoe. 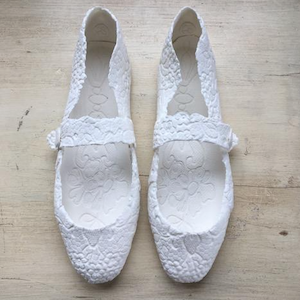 If you run a business in or around Sevenoaks then we can make you a shoe that reflects your business for a small fee. Sponsored shoes will have the business name and card/website linked. 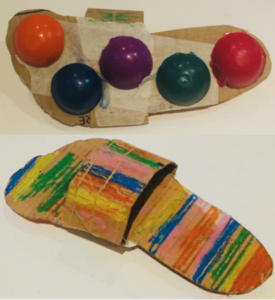 Rub the bottom of your shoe using wax crayon, pencil etc on card or thick paper. Cut it out and bring it to the Gallery. Draw round your shoe and decorate it. Any media, style or subject. A self portrait ? Cut it out and bring it into the Gallery. We will add your shoe or footstep to the project, remember to leave your name. Drop in and join us for the PV Thursday 5th April 4 30 – 7 30pm. 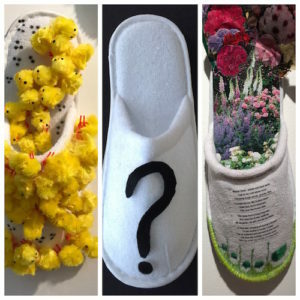 Join Artists Angela Dewar, Amanda Hopkins and Rozenn Gladwell to make paper shoes, felt shoe flowers or use arty sandals to draw with your feet. Join Textile Artists Judy Baldachin, Angela Dewar and Susanne Beard. It is also LIBRARY FUN DAY so lots of activities throughout the Kaleidoscope Building.